Nairobi Club, November 29: Second round action got on court today (Tuesday) at Nairobi Club and Public Service Club under blue skies for a change. After a day one elimination of all the Kenyan players on the girls' draw, the boys stepped up to make amends for the girls’ exit. Third seed Kevin Cheruiyot proved too good for Rwanda’s Fabrice Tuyishime. After playing a close first set which the Kenyan won 6-4, the second set was all one way traffic for Cheruiyot as he raced to a 5-0 lead before Tuyishime ticked the register in the second set. That would however be his only joy as Cheruiyot closed out the match in the next game for a 6-4, 6-1 victory to see him move into the round of 16. Top seed Sheil Kotecha opened his account today with a sluggish but dominant performance, probably due to his long schedule last week. Kotecha was however never in trouble when he played Oliver Jevtovic of the United States. A second time lucky loser, Jevtovic was no match for Kotecha and lost 2-6, 1-6. A consistent performer over the two weeks has been Great Britain’s Kai Maxted who has had to come from the qualifying draw – both times. In week one, Maxted made it from the preliminaries to make his way to the quarterfinal with a form of tennis that grinds down his opponents. Maxted has arguably been on court the longest in this series. 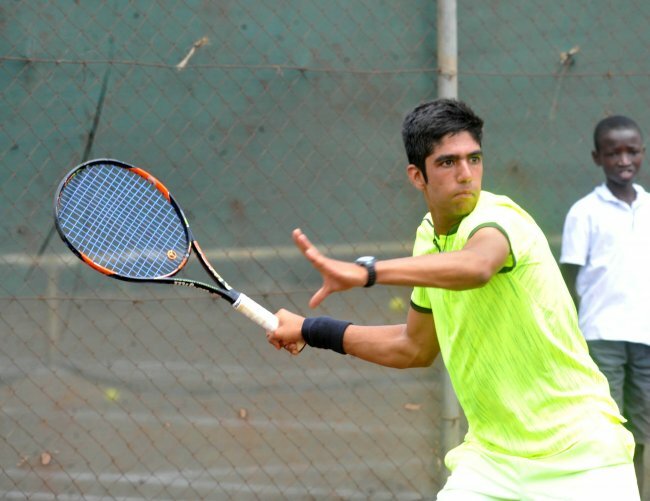 Today was no different when he faced ninth seed and a debutant to Kenya – India’s Dev Javia. An error prone opener from the Indian made way for a quick 6-0 first set victory for Maxted who’s points are yet to earn him a significant ranking. Javia however proved his ranking in the second set, pushing the Briton all the way. A tie break would decide matters and a few brilliant points from Maxted stopped the match from going the full distance. Maxted won 6-0, 7-6(5). The other Kenyan on the boys' draw, Ryan Randiek was a straight sets loser against Poland’s Pawel Jankowiak. The 14th ranked Polish was too strong for Randiek, putting aside the Kenyan’s challenge with a 6-1, 6-3 score line. In another shock result of the day, the girls' second seed Mariam Mujawimana (Burundi) suffered a 6-3, 6-2 drubbing at the hands of Ukrainian Valeriya Rosenkova. The biggest girls' match however was a Ukrainian – Serbian affair. Last week’s semifinalist Elena Gemovic (Serbia) always brings it to the court. Battling Ukrainian, Juliya Popyk, Gemovic closed out a tight opening set in a marathon tie break but dropped a notch in the second to surrender the set before a dog fight in the third saw the match go her way in a 7-6(8), 3-6, 7-5. Celestine Avomo Ella, the girls' number one from Gabon was also in an emphatic form as she put aside the challenge of France’s Isabelle Bassi – 6-4, 6-2.